There’s a new range of concealed joining systems that’s revolutionising the design and cabinetry hardware industry worldwide. And now thanks to Häfele, it’s available in Australia. The key to the award-winning Striplox range is its speed of assembly. What makes Striplox so fast is a unique interlocking design that locks in one action to evenly spread the load along the length of the joint to give you a strong and tight connection every time. This versatility ensures it’s perfect for hundreds of tool-less applications and installations on or off-site. Internationally patent protected, the entire Striplox range suits all standard manufacturing processes and incorporates the internationally recognised system 32 for ease of fitting and assembly. 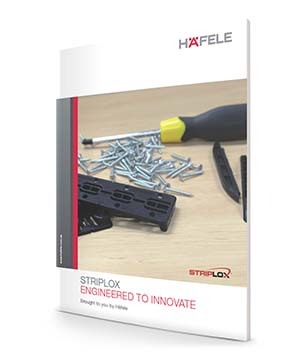 Striplox rapid assembly connectors are ideal for fastening together a wide variety of materials and applications, including both commercial and residential fit-outs, panels and ceilings, joinery, furniture, shelving, modular kitchens and more.